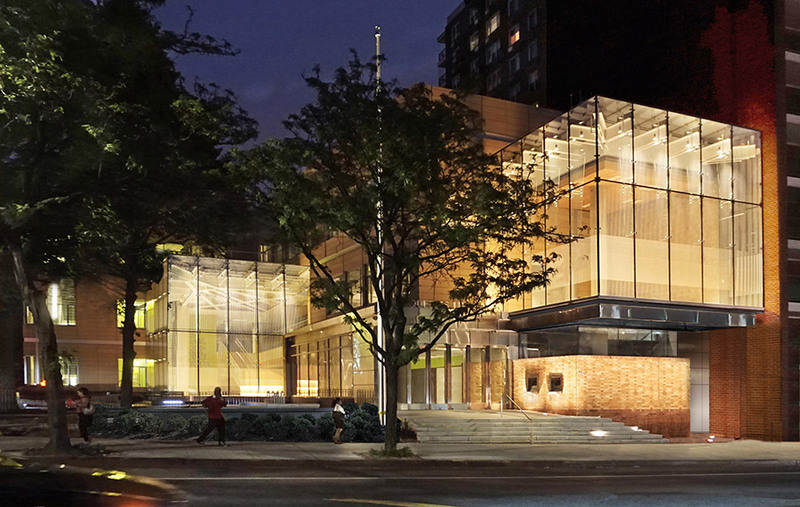 2017 Best of Design Award for Civic - Educational: Elmhurst Community Library Architect: Marpillero Pollak Architects Location: Queens, New York With over 80,000 users speaking more than 57 languages, Elmhurst is the second-busiest circulating library of the 64 in Queens Library’s network. The building’s massing maximizes the impact of an existing community park and highlights the civic role of two reading rooms that emit a welcoming glow after sunset. The main circulation spine extends the streetscape toward a group of trees in the block interior. A system of brightly colored “portals” supports orientation and interaction among programmatic spaces catering to diverse age groups, reinforcing the library’s neighborhood significance. The main architectural elements are two structural glass cubes that position patrons within the community park and on the urban thoroughfare of Broadway. The park cube makes legibile the operations of the library’s two main floors with a monumental stair grounded by a bookshelf, while the Broadway cube floats above the main entry displaying the work 955 Shapes by artist Allan McCollum. “This handsome new library takes full advantage of its site with its richness in textures and colors, and provides a welcoming cultural and educational resource for this Queens community.” —Irene Sunwoo, Director of Exhibitions, GSAPP (juror) Structural Engineer: Severud Associates General Contractor: Stalco Construction Percent for Art (Selected Artist): Allan McCollum Structural Glass: W & W Glass Material Supplier for Terra-cotta Rainscreen: Boston Valley Terra Cotta Honorable Mention Project: Lakeview Pantry Architect: Wheeler Kearns Architects Location: Chicago, Illinois Lakeview Pantry has transformed a dilapidated pet daycare into its first permanent home. Located adjacent to an L station, the renovated building immediately sends a welcoming message to both neighbors and clients with its large storefront windows and colorful, bright interiors. The goal of the architecture is to create a space that provides dignity to those in a time of need, furthering the Pantry’s mission. Honorable Mention Project: University of California, San Diego Jacobs Medical Center Architect: CannonDesign Location: La Jolla, California The ten-story UC San Diego Jacobs Medical Center functions as three medical specialty centers—housing inpatient services for high-risk obstetrics and neonatal care, cancer care, and advanced surgical care. 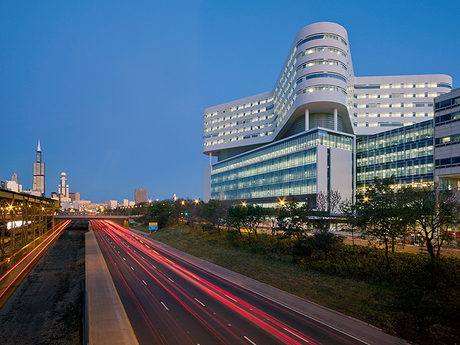 The building’s overall curvilinear form was driven not only by the design of the patient units, but also by the goals of capitalizing on views, maximizing daylight, and minimizing solar gain and glare. The elevated gardens and terraces bring nature up to the patient level. For 47 years, the Lakeview Pantry on Chicago’s North Side has provided for the poor and hungry. Through food distribution and self-help initiatives and programs, the pantry has become a staple of its immediate neighbors as well as the greater Chicago community. When it came to establishing its first permanent space, the much-lauded organization turned to local firm Wheeler Kearns. Originally known as the People’s Pantry of Lakeview, the organization was spread out among a variety of buildings throughout the neighborhood, often with administrations and operations in separate spaces. 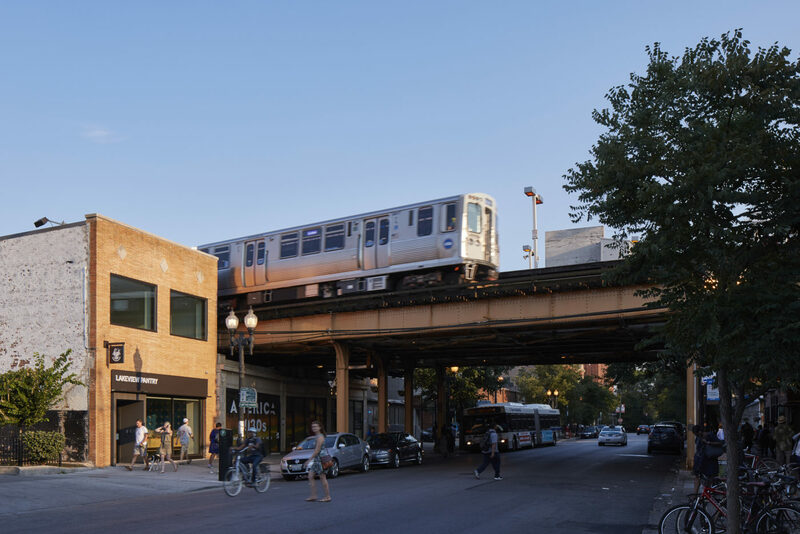 An adaptive reuse project, the new Lakeview Pantry brings the entire operation under one roof a few blocks from Lake Michigan, nestled up against the overhead L tracks. 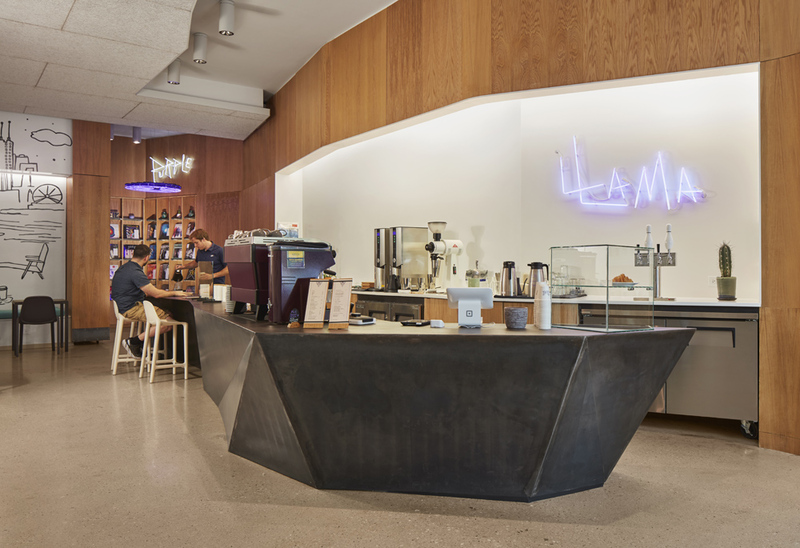 Wheeler Kearns’s design for the 7,500-square-foot two-story space brings together the Pantry’s food distribution and social services programs, as well as the administrative staff, with connected spaces and natural light. 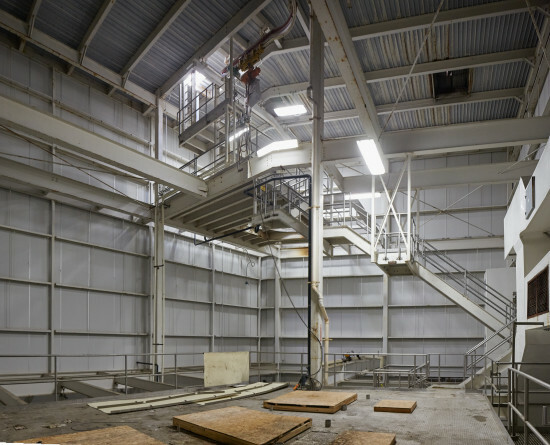 The lower level includes the waiting area with a distribution counter, walk-in freezer-cooler, dry storage, and sorting room. The goal of the public face of project was to match the Pantry’s own mission by providing a dignified space for those in need. The bright front space serves over 8,000 people a year, with over 800 tons of food distributed in the form of 14-day supplies, so the front of house sees a lot of traffic and a lot of food. Bathed in sunlight, a wood staircase leads to the upper level. Efficiently laid out offices fill the majority of the upstairs. Much-needed private meeting spaces, a conference room, a shared lunchroom, and open staff office space are lit from above and from the two ends of the thin building. While the project was only recently finished, it has already been recognized with the Richard H. Driehaus Foundation Award for Architectural Excellence in Community Design, an annual award given to outstanding built community-design projects in Chicago. The Local Initiative Support Corporation (LISC) Chicago brought together over 1,500 architects, developers, business leaders, neighborhood advocates, and elected officials to present the 23rd Annual Chicago Neighborhood Development Awards (CNDA). The awards recognized nine organizations for their work in community development and architectural design. 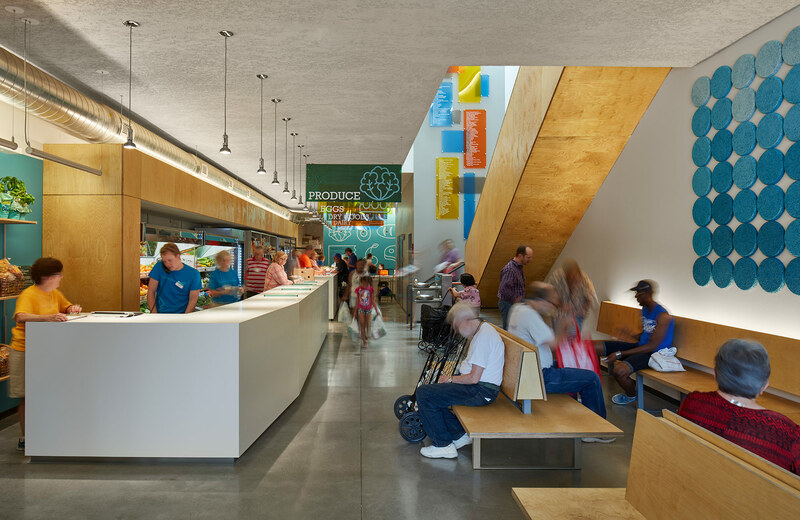 Taking home the night’s top architectural award, the 20th Richard H. Driehaus Foundation Award for Architectural Excellence in Community Design, was Wheeler Kearns Architects for the Lakeview Pantry. The Pantry has been a community institution in Lake View, on Chicago’s North Side, for 45 years. Recently outgrowing their rented one-story building, the organization needed to expand. Working with Wheeler Kearns, they acquired and rehabilitated a two-story masonry building just below an L station. The 7,500-square-foot space now holds a community pantry with gathering space on the lower level and administrative office space on the upper level. 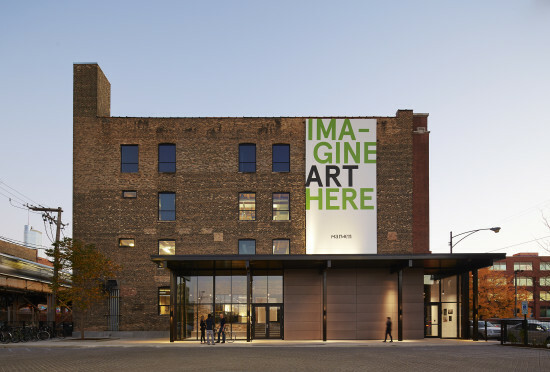 Second and Third place for the Richard H. Driehaus Foundation Award for Architectural Excellence in Community Design went to SOM for Chicago Public Library – Chinatown Branch and to Landon Bone Baker Architects for Terrace 459 at Parkside of Old Town. Postmodernist icon Tom Beeby was also recognized with the Richard M. Daley Friend of the Neighborhoods Award for lifetime achievement. Beeby has chaired the Richard H. Driehaus Award for Architectural Excellence in Community Design jury for the last 20 years. “For more than two decades the Chicago Neighborhood Development Awards and the Richard H. Driehaus Foundation Award for Architectural Excellence in Community Design have celebrated Chicago’s neighborhoods while honoring and recognizing the outstanding achievement in neighborhood real estate development, community engagement, neighborhood planning, and building stronger and healthier communities,” said LISC Chicago Executive Director Meghan Harte. “Community development by definition is neither easy or fast, but the people and organizations who do this work in our neighborhoods have succeeded in making progress. It is our neighborhoods that provide the flavors and texture that make Chicago unique. At CNDA, we stop briefly to recognize and celebrate individual achievements and the communities that together we have created by design.” Other Chicago Neighborhood Development Awards given out included: The Chicago Community Trust Outstanding Community Plan Award for the Near North Unity Program for Near North Quality-of-Life and Design Guidelines, The Richard H. Driehaus Foundation for Outstanding Non-Profit Neighborhood Real Estate Project Award for the The Breakthrough FamilyPlex, The Polk Bros. Foundation Affordable Rental Housing Preservation Award Winner to the Chicago Metropolitan Housing Development Corporation for Renters Organizing Ourselves to Stay, The Outstanding For-Profit Neighborhood Real Estate Project Award Winner to DL3 Realty for Englewood Square, The Woods Fund Chicago Power of Community Award Winner to the Southwest Organizing Project for Reclaiming Southwest Chicago Campaign, The Blue Cross and Blue Shield of Illinois Healthy Community Award Winner to Saint Anthony Hospital Mental Health Services. Along the shores of southwest Michigan’s Upper Jeptha Lake sits one family’s home away from home. 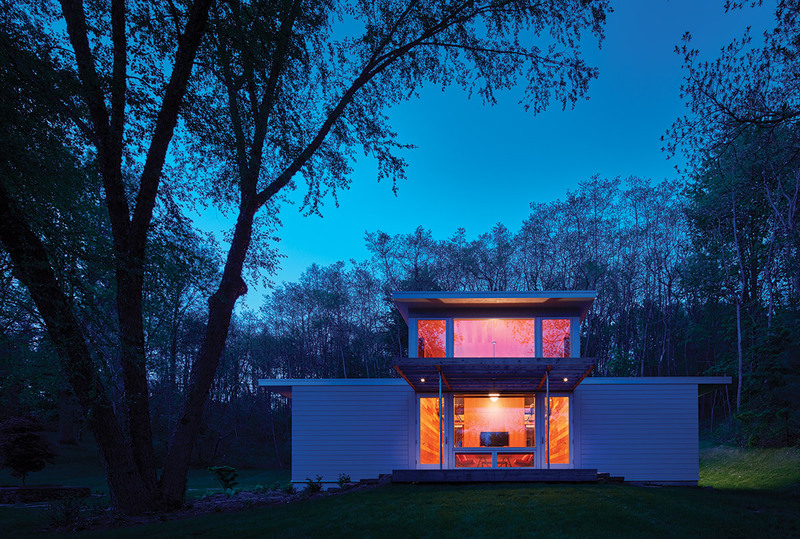 Created in an ongoing collaboration between the owners and Chicago-based Wheeler Kearns since the 1990s, the retreat is a cluster of four small buildings. The relationship between Wheeler Kearns and the client goes well beyond this single project—their long history of building together in Chicago created a rapport that is exercised here. Based around an existing cottage that Wheeler Kearns remodeled, the Upper Jeptha Lake Retreat is defined as much by its interior spaces as the spaces in between the structures. Enclosing a yard and pool, two outbuildings and a forest provide an intimate entertainment area. These multiple outdoor spaces can be used for family dining or large group events. The latest addition to the project completes the campus as a year-round multi-generational getaway. One of the two new buildings is a guesthouse for two families. The 960-square-foot structure includes two bedroom suites, a small kitchen, and a communal area. An intimate loft space sleeps two with 360-degree views of the forest and lake—a grandkids’ paradise. Covered patios allow for more private or group eating. The second building houses an exercise room, garage, and a patio for grilling. A small boathouse sits at the water’s edge. Each structure’s form is reminiscent of the other, but they were not designed to perfectly match. Instead they are tied together with carefully curated material and detail palettes. The entire campus is painted in a cool gray that recalls the bark of surrounding beech trees. In contrast to the calm exteriors, the interiors are rich and warm. Douglas fir is used from veneered plywood to wide planks, and lines most surfaces. Hidden appliances and efficient layouts make the most of small spaces. Interior furnishings throughout the sunlit space, such as bright fabrics and classic modern pieces, were chosen by interiors firm RDK Design. “The clients are very involved,” explained Wheeler Kearns principal Mark Weber. “They would give us programmatic elements, but would allow us to compose the best scheme for the site.” The result is a retreat specifically catered to the needs of multiple generations of a family coming together away from the city bustle. Bentonville, Arkansas will soon be home to a new art space designed by Chicago-based Wheeler Kearns Architects. The Crystal Bridges Museum of American Art has announced plans to convert a former Kraft cheese factory in Bentonville into new gallery space for unconventional programming. Like MoMA’s PS1 in Queens, New York, this venue will facilitate the showing of temporary, interactive, and performance art in a less formal setting. The museum’s permanent collection is currently displayed in a Moshe Safdie-designed building that bridges natural spring ponds in a forested setting. The museum grounds are also home to the Frank Lloyd Wright designed Bachman-Wilson House, which was moved from its original location along the Millstone River in New Jersey. The new exhibition space will take on a much different feel than the polished Safdie galleries. The former factory will be allowed to maintain much of its industrial character throughout its 63,000 square feet. The new space's downtown location will also distinguish it from the museum's more rural main campus. The biggest difference, however, will be the way in which art is displayed and created in the space. In addition to film screenings and performances of music and theatre, the former factory will host a new multi-disciplinary artists-in-residence program. As such, Wheeler Kearns plans to design the space to be flexibly-used. 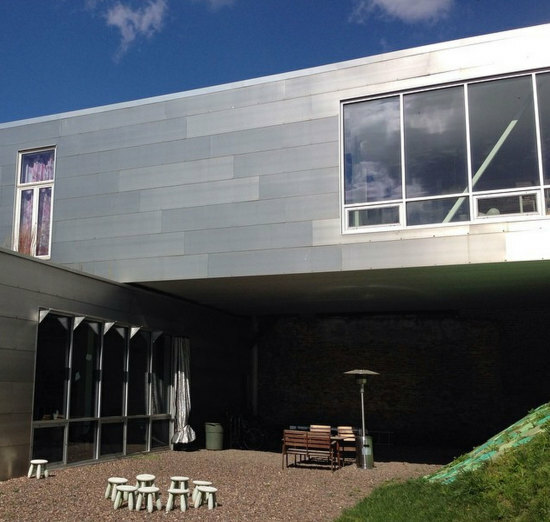 Crystal Bridges will also collaborate with the Massachusetts Museum of Contemporary Art (MASS MoCA) to develop the programing for the space. The Walton Family Foundation, Wal-Mart's philanthropic group, was heavily involved in the creation of Crystal Bridges. Steuart and Tom Walton—grandsons of Walmart founder Sam Walton—are leading the foundation’s support the new space. Both have served on the museum's Board of Directors. The yet-to-be-named exhibition space is scheduled to be completed in 2018. AIA Chicago has announced the winners of the Tiny Homes Competition. Launched in November 2015, the competition solicited entries to address young adult homelessness in Chicago as part of the Tiny Homes Summit. The winning entry was designed by a Chicago-based team of Notre Dame graduates. 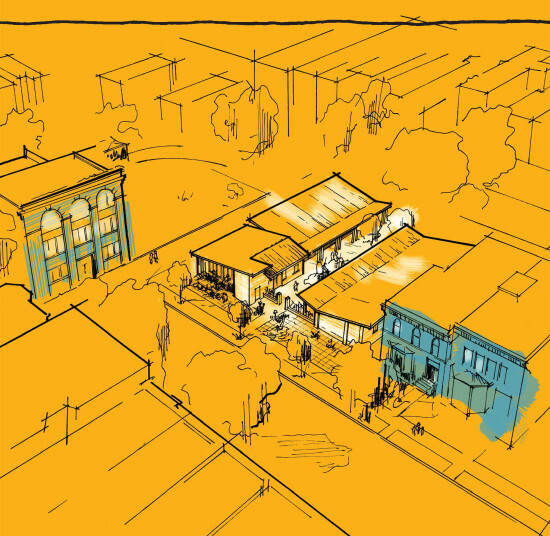 Terry Howell, AIA, LEED GA, Lon Stousland, both associate architects at Antunovich Associates, and Marty Sandberg, AIA, partner at Via Chicago Architects, site their connection to the Bronzeville neighborhood, location of the proposed project, as a driver in their design. The team commented in a press release, “Terry’s parents are long-time Bronzeville residents, and have hosted us for countless barbecue nights just two blocks from the competition site. Designing for a location with such a personal connection provided extra incentive—a chance to create something not simply beautiful, but also practical, contextual, and potentially transformative.” The winning entry, “A House for Living In,” is comprised of 11 336-square-foot units and one interior community space gathered around a central courtyard. At an estimated $73 per square foot, the design is substantially less expensive than typical affordable housing, which is typically in the range of $200-400 per square foot, according to the AIA’s press release. The central courtyard is entered through a locked front gate, and is envisioned as a gathering spaces and communal garden. Juror Benet Haller commented, “The submission’s site and floor plans are very efficient. Locations for storage are well thought out and the sleeping area is nicely separated from the living area. The use of brick on the exterior is a nice touch. Everything about this submittal works well.” Chicago-based Wheeler Kearns Architects was awarded second place with their design “Tiny Town.” Third place was awarded to another Chicago–based team made up of Joe Villanti, AIA, senior project architect at Pappageorge Haymes, Tyler Hopwood, and Ryan Arnaudov, also of Pappageorge Haymes for their project “Box House.” Honorable Mentions were awarded to New York City–based David Bravo Salva and Blanca Rodriguez Peis, and Chicago–based team Georgi Todorov of Pappageorge Haymes and Petya Petrova of Pierre-Yves Rochon. A prototype of “A House for Living In” will be constructed for the Tiny Homes Summit at the University of Illinois at Chicago on April 18 to 19. Organized by AIA Chicago, the AIA Chicago Foundation, Landon Bone Baker Architects, Windy City Times, and Pride Action Tank, the competition drew 250 submissions from 12 countries. Funding for the competition was provided by the Alphawood Foundation.